Cassie Fetsch is a regular volunteer for The Leukemia & Lymphoma Society’s (LLS) Minnesota chapter. 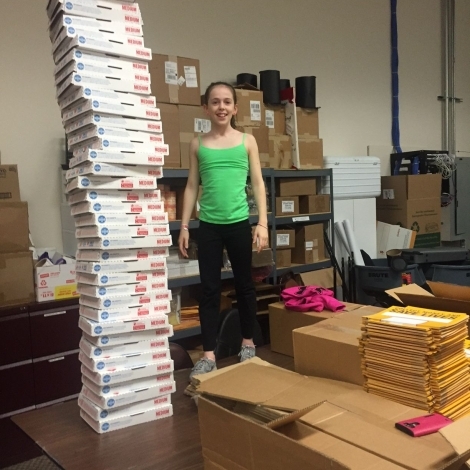 When school is out, staff members can count on Cassie to be in the office folding letters, stuffing and labeling envelopes, counting Team In Training brochures, cleaning out drawers or putting together pizza boxes. Since Domino's sponsors LLS's Pennies for Patients program, they donate all the boxes to ship campaign supplies. This year, Cassie assembled boxes for more than 800 schools! In 2010, when Cassie was in kindergarten, her cousin Kylie was diagnosed with acute lymphoblastic leukemia (ALL) at age 10. That year, Cassie's classmates each made a drawing with a note of encouragement during the week of their school’s Pennies for Patients campaign. The teacher (Mrs. M) used the drawings to create a special book for Kylie and Cassie presented it as a gift. Kylie loved it! Cassie has grown up volunteering with her mom -- at art festivals, bike rides, walks and training runs, and also delivering holiday baskets to families in need. Cassie loves to help in any way she can.